This classic safari offers a magnificent journey through the most beautiful variety of locations in Namibia and includes the Chobe NP in Botswana and Victoria Falls in Zimbabwe. There are some long travel days on this journey but we have 2-night stays at all the highlights. The lodges are beautiful, comfortable & make for a great adventure safari. Departs: Windhoek, Namibia on Sunday at 8:00am. Ends: Victoria Falls, Zimbabwe on Saturday at +/-8:00am. • This classic safari offers a magnificent journey through the most beautiful variety of locations in Namibia and includes the Chobe NP in Botswana and Victoria Falls in Zimbabwe. • There are some long travel days on this journey but we have 2-night stays at all the highlights. • The accommodation throughout this classic journey is of 3- to 4-star style and are chosen not only for their service and comfort level but also for their wonderful locations and local wildlife viewing opportunities. 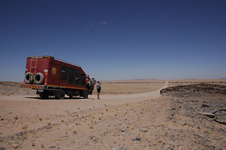 • For Etosha we stay inside the national park and for the Namib we stay on a private lodge bordering the national park. • 13 breakfasts, 4 lunches and 8 dinners are included, all of which are provided by the lodges at which we are staying. • Where meals are not included there will be an opportunity to buy a meal en route or at a restaurant in the evening. The following day we visit the Namib Nauklauft National Park to witness the amazing landscapes of Sossusvlei and Deadvlei. The vleis are clay pans formed by the occasional flooding of the Tsauchab River. 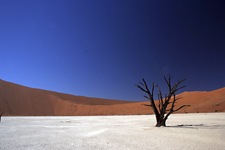 Sossusvlei is dotted with ancient Camel Thorn trees (Acacia erioloba) while the trees on Deadvlei are lifeless and stark against the surrounding tall orange sand dunes. Includes: Entrance fees to Sesriem Canyon and Naukluft National Park. Day 1: Breakfast not included. Day 1: Lunch will be an own expense meal. Day 1: Dinner provided by the lodge. Day 2: Breakfast provide by the lodge. Day 2: L Lunch will be an own expense meal. Day 2: Dinner provided by the lodge. Distance / Time: 304kms, ± 4½ hours excluding stops for sightseeing & lunch. Includes: Day 3: Breakfast provided by the lodge. Day 3: Lunch will be an own expense meal. Day 3: Dinner will be an own expense meal at a local restaurant. Overnight: Zum Kaiser - twin share rooms with en suite facilities. Telephone & restaurant. WiFi in main building. Distance / Time: 346kms, ± 5 hours excluding stops for sightseeing. 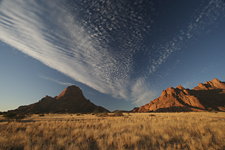 We head inland to the Tsiseb Conservancy and the Brandberg, a mountainous granite outcrop. Standing at over 2,600m it towers above the surrounding plains and is visible from a great distance. The Tsisab Ravine at the foot of the mountain contains more than 1000 rock shelters and some 45,000 rock paintings including the famous “White Lady”, which is a short 40 minute walk up the ancient watercourse. Our lodge, situated in the dry Ugab River valley, is ideally situated to explore the area in search of the rare desert elephants and we’ll join a local guide on a 4WD excursion. Being far ranging and elusive, a sighting of the elephants cannot be guaranteed, but with the knowledge of our local guide the day will be fascinating. Includes: Entrance to Brandberg, walk with local guide to White Lady painting and 4WD excursion with local guide. Day 4: Breakfast provided by the hotel. Day 4: Lunch provided by the lodge. Day 4: Dinner provided by the lodge. Day 5: Breakfast provided by the lodge. Day 5: Picnic lunch provided by the lodge. Day 5: Dinner provided by the lodge. Distance / Time: 227km, ± 2½ hours, excluding stops for sightseeing. The salt pan in Etosha is the remnants of a large lake that dried up thousands of years ago. This “Great White Place” is 120km wide and forms the central attraction in the National Park. Natural springs and waterholes around the edges provide life giving water that sustains the wildlife in this otherwise arid area. Elephants coated in the white salt dust from the pan make for extraordinary photos. Our camp is located on the edge of a floodlit waterhole allowing us to get a glimpse of the nocturnal animals that come to drink, including the rare black rhino, lion and possibly leopard. We enjoy the evening sitting at the waterhole in anticipation. Includes: Entrance fees to Etosha National Park, 1 x full day game drive in Etosha NP. Day 6: Breakfast provided by the lodge. Day 6: Lunch own expense meal. Day 6: Dinner own expense at local restaurant. Day 7: Breakfast provided by the lodge. Day 7: Lunch own expense meal. Day 7: Dinner own expense at local restaurant. Overnight: Day 6: Okaukuejo, twin rooms en-suite with swimming pool, restaurant and bar. Day 7: Namutoni, twin rooms en-suite with swimming pool, restaurant and bar. 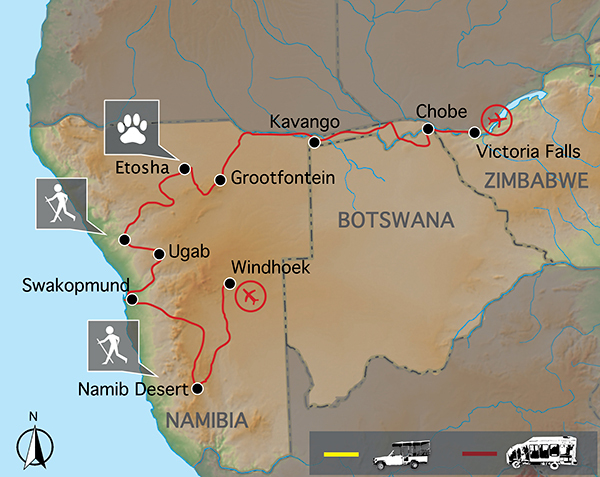 Distance / Time: 560kms, ± 5 hours excluding stops for sightseeing & lunch + 1 afternoon drive & 1 x full day game drive in Etosha NP. 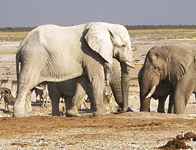 Includes: Morning game drive in Etosha NP. Day 8: Breakfast provided by the lodge. Day 8: Lunch own expense meal. Day 8: Dinner own expense at local restaurant. Overnight: Roys Rest Camp – twin permanent chalets with en-suite facilities, Swimming pool, bar & restaurant. WiFi not available. Distance / Time: 428kms, ± 5.3 hours, excluding stops for sightseeing & lunch. Include: Entrance fees & game drives. Day 9, 10: Breakfast provided by the lodge. Day 9, 10: Lunch provided by the lodge. Day 9, 10: Dinner provided by the lodge. Overnight: Nunda River Lodge – twin share permanent tents with en-suite facilities. Swimming pool, bar, restaurant, telephone. WiFi not available. Distance / Time: 432kms, ± 5.4 hours, excluding stops for sightseeing & lunch . Heading east we cross the Caprivi Strip which separates Angola from Botswana and enter Botswana at the Ngoma Border and drive across the Chobe National Park to the small town of Kasane. Our lodge has views of Chobe River as it flows into the National Park and this river attracts an abundance of wildlife. We settle into our lodge and enjoy a sunset from the viewing deck. Up early for an exciting open 4WD game drive where we hope to spot some big game including lions, buffalo and possibly the elusive leopard. Later in the afternoon we have the incredible experience on the Chobe River where we head out by boat into the park and get close to the elephants as they quench their thirst. We leave the park as the golden sun slips below the horizon. Includes: Day 11: Breakfast provided by the lodge. Day 11: Lunch own expense. Day 11: Dinner provided by the lodge. Day 12: Breakfast provided by the lodge. Day 12: Lunch own expense. Day 12: Dinner provided by the lodge. Overnight: Chobe Safari Lodge – twin rooms with en-suite facilities, swimming pool, restaurant & bar. WiFi available. Distance / Time: 56km, ± 1½ hours, excluding border formalities, stops for sightseeing & lunch. Includes: Entrance to see the Victoria Falls Zimbabwe. Day 13: Breakfast provided by the lodge. Day 13: Lunch own expense. Day 13: Dinner own expense at local restaurant. Overnight: A’Zambezi Lodge, twin rooms with en-suite facilities. Swimming pool, restaurant, bar and telephone. Free WiFi available. Distance / Time: 86kms – 1.5 hours, excluding border formalities. Optional Activities: Sunset cruises, scenic flights & many more. Includes: Day 14: Breakfast provided by the lodge Day 14: Lunch not included Day 14: Dinner not included. 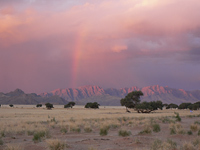 Sustainable Tourism: In the Ugab wilderness region we stay at the White Lady Lodge. A partnership was signed in 2003 and the local community benefit through the employment and a percentage of the income of the lodge. There are also other spin-offs such as the sale of fire wood to the lodge. 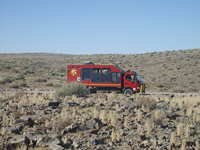 For the majority of this safari you travel in a custom safari truck with 12 seats; or (on 5% of tours) Mercedes Sprinter minibuses with 12 forward facing seats and air conditioning. The game drives in Etosha will be in the tour vehicle, with large sliding windows. For the game drives in Ugab and Chobe we use open sided 4WD vehicles with local guides. 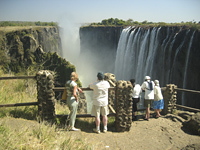 Craft shopping for carvings, batiks, paintings and clothing is best in Victoria Falls which has a wide variety of curios. Botswana has beautiful grass weavings but these are available mostly at curio shops as there are hardly any craft markets in Botswana. 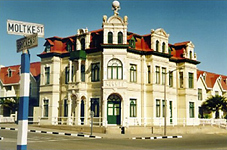 Namibia also has unusual and interesting curios and crafts. If you see something you like, it is best to buy it because it is unlikely that you will see something similar further along. Crafts from change from region to region. 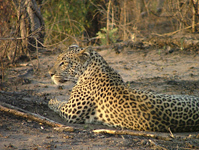 •	As this tour spends a large amount of time in wildlife areas it is essential that clients adhere to the tour leaders (and local guides) instructions regarding interaction with wildlife, camp safety and game walk/drive rules. •	You will need a valid passport and visas for entry into Zimbabwe, Namibia and Botswana. •	We recommend that you bring Euro, US$ or South African Rand for personal expenses on this trip but please note that in Namibia, Euro and US$ will need to changed into Namibian $ or South African Rand as shops, restaurants and market vendors only accept N$ and ZAR. In Botswana please note that foreign currency will need to changed into Botswna Pula as shops, restaurants and market vendors only accept BWP. 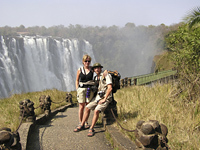 Expenses in Victoria Falls can be paid in US$ or Euro and major credit cards can also be used for optional activities throughout this tour. See the Sunway tour dossier for approximate costs of drinks and meals etc. • Is it safe? Zimbabwe has been involved in a political power struggle over the past few years, and this has deterred tourists from travelling to the country. Having said this, the Zimbabwe people are always friendly and helpful to visitors to their country and tourists are welcome with open arms. 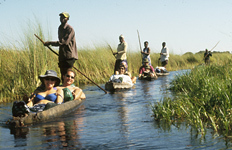 Botswana and Namibia are safe and your guide knows both countries intimately and will endeavor to show you the best parts while looking after you. In the wild areas your guide will brief you on the necessary precautions, follow this advice and you will be fine. Be aware of your personal belongings and you will have a great trip!